The sculptor Martin Puryear will represent the US at the 2019 Venice Biennale. The presentation will be commissioned by New York's Madison Square Park Conservancy and its deputy director and senior curator, Brooke Kamin Rapaport—the first time the pavilion has been organised by a public art body rather than a museum or university. Puryear will create new works for the US Pavilion, including an outdoor installation. He and the conservancy will also undertake outreach programmes for underserved youth in partnership with the New York philanthropist Agnes Gund's Studio in a School organisation and Istituto Santa Maria Della Pietà in Venice. The art historian Darby English has been brought on as the project’s scholar and will write a catalogue essay, along with the art historian Anne Wagner. Tod Williams Billie Tsien Architects will design the exhibition, which is sponsored in part by a $250,000 grant from the State Department, as in past years. The 77-year-old African-American artist is best known for his remarkable work with wood, which he shapes in unexpected and suggestive ways. Puryear was a MacArthur Foundation Fellow in 1989 and the subject of a retrospective at the Museum of Modern Art in 2007-08. In 2011, he received a National Medal of the Arts from President Obama. 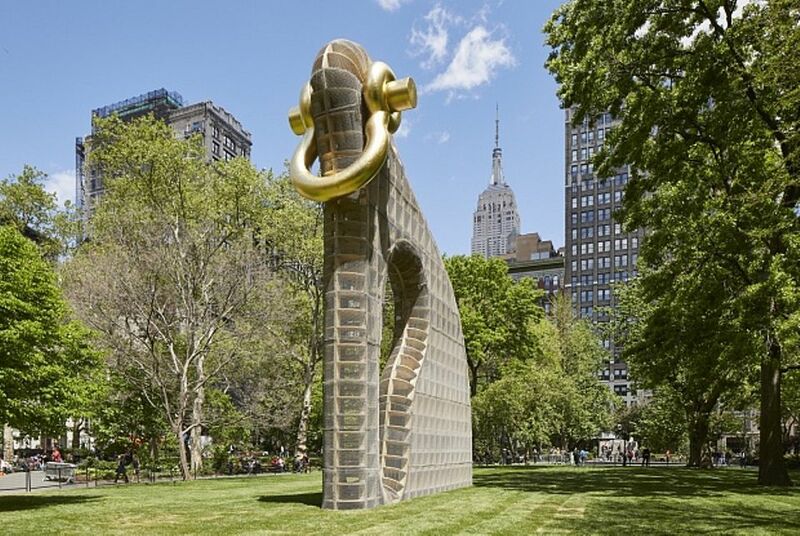 Last year the artist worked with the Madison Square Park Conservancy to construct his largest temporary outdoor work, a 40-foot-tall sculpture titled Big Bling. The vaguely animal-like wooden form was wrapped in chain-link fence and headed off by a shackle covered in gold leaf—an encapsulation of the quiet grandeur for which he is known. Rumors of Puryear’s selection have been swirling for more than a week. The confirmation of the widely respected artist is likely to come as something of a relief to art world observers, who have been wondering who would represent the US in Venice, given President Trump’s disinterest in the arts and understaffing at the State Department. The artist Justin Lieberman started a Change.org petition calling for conservative painter Jon McNaughton—whose recent works include a portrait of President Trump hold a tattered American flag on a football field—to be chosen. The State Department has final approval over the Biennale artist, who is selected by a panel of art professionals known as the Federal Advisory Committee on International Exhibitions, assembled by the National Endowment for the Arts.